I have walked by Mac Court two days a week now for nearly two years. I am back on campus teaching a class, and the old, semi-abandoned building is directly in the path of my campus commute. In the late '70s and early '80s, Mac Court was a daily destination for me. I remember its outside walls alive with climbing ivy and its insides bustling with practices and preparations for the next event. Walking by the building these past few years, I've felt torn whether to visit or not. As a student, I shared four great years in the grandeur of her space, yet recently I had passed on by, head down and hurried, for fear of discovering that this old friend was perhaps something other than what I remembered. But a month ago, while walking on the east side of University Street on a sunny afternoon, I noticed that the doors to Mac Court were open. I didn't hesitate. I walked from the sunlight into the dark corridors of the once proud and productive building. I opened the double doors to the court. Instantly, I was home. I didn't have to look to see. I didn't have to breathe to smell. I didn't have to listen to hear. I didn't have to feel to sense all that this building meant to me. It fit like my first uniform I wore as a Duck in the late '70s. Not quite new, not quite fashionable, not quite bold or clean, but it was beautiful. Mac Court's beauty is not aesthetic, but visceral. My senses recalled the trademark characteristics of the place: the smell of popcorn, the squeak of basketball sneakers stopping and starting, and the long-gone but heavily felt presence of the thousands of fans who wandered these corridors, climbed the narrow wooden staircases, and squeezed themselves into the cramped folding seats. My own relationship with the building was different. For a brief moment, I was the fortunate recipient of the wildly vocal and proudly passionate enthusiasm of the Mac Court fans. And in my lifetime of sport, there has been nothing finer than practicing and playing in The Pit. Wooden pullout bleachers once framed the arena floor, and frothing students and well-behaved families mixed together to pound the bleachers and raise the roof with stomps and cheers as we ran up and down the majestically suspended floor. The crowd's response to the action and anticipation of what could happen next caused the building to inhale and exhale with every play. Fans were close to the action, and with this proximity came a depth and breadth to their intense and heartfelt vociferations—one felt almost gladiator-like, awash in the roar. Seeing, smelling, listening, and feeling took me back to game times, but what came to me next was the overwhelming peace I felt in the surrounding silence of being alone in Mac Court. And that's when it hit me. That's what I really missed. The early mornings, the late evenings, the Sunday afternoons when the seats were empty, the popcorn unpopped, and the sound of sneakers starting and stopping found its echo in that of only one pair: mine. I had a basket and a ball, and a classroom for the ages. It was a laboratory: a place to move and create and work, the crucible always filling and emptying with the endless repetition of dribbling drills to control the ball, shooting hundreds of shots to give me a better chance of scoring on game day. I played one-on-one games against the best defender I could conjure out of imagination, and occasionally, an abandoned chair stood its ground in front of me. It was hard work and it was lonely work, the sacrifice of honing one's craft. But I loved it. I now know that my time in Mac Court was not much different than that of a music student repeating scales, seeking to become, perhaps, not the best, but one's best through the solitary and dogged pursuit of excellence. I walked back out into the sunlight that day reminded that Mac Court truly was the teacher and friend that I had imagined. The time I spent in her classroom, both alone and with my teammates, was not about what we got from the experience, but what we became through lessons learned on the hardwood. 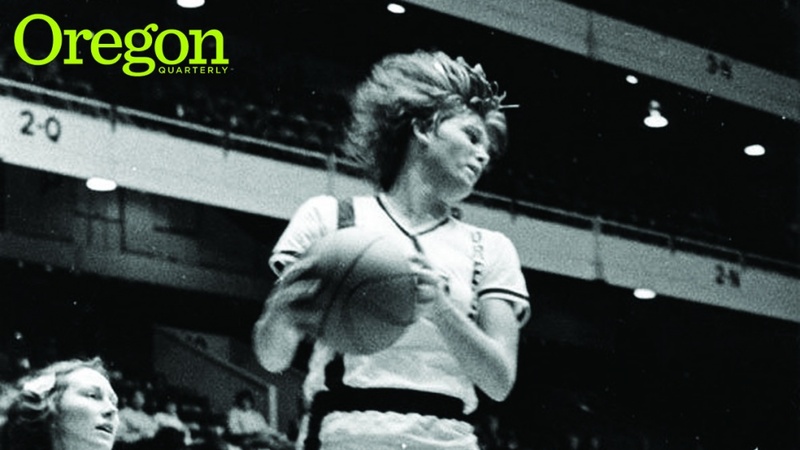 Bev Smith, '88, played forward for the Ducks from 1978 to 1982, was a member of the 1984 Canadian Olympic team, and was the UO's head women's basketball coach from 2001 to 2009. She is now the executive director of Kidsports in Eugene.